Most days, I'm a big fan of Paul Krugman's columns. Unlike his economics, which makes a few too many curtsies to orthodoxy, his political interventions are righteous in tone, right-on in content, and what's more, strategic -- unlike many leftish intellectuals, he clearly cares about being useful -- about saying things that are not only true, but that contribute to the concrete political struggle of the moment. He's so much better than almost of his peers it's not even funny. But -- well, you knew there had to be a but. But this time, he's gotten his economics in his politics. And the results are not pretty. Blame the euro. Fifteen years ago Greece was no paradise, but it wasn’t in crisis either. Unemployment was high but not catastrophic, and the nation more or less paid its way on world markets, earning enough from exports, tourism, shipping and other sources to more or less pay for its imports. Then Greece joined the euro, and a terrible thing happened: people started believing that it was a safe place to invest. Foreign money poured into Greece, some but not all of it financing government deficits; the economy boomed; inflation rose; and Greece became increasingly uncompetitive. I'm sorry, but the bolded sentence just is not true. The rest of it is debatable, but that sentence is flat-out false. And it matters. The numbers in the graph are fine, as far as they go. And there is the first problem: how far they go. Here's the same graph, but going back to 1980. Starting the graph ten years earlier gives a different picture -- now it seems that the near-balance on current account in 1993 and 1994 wasn't the normal state before the euro, but an exceptional occurrence in just those two years. And note that that while Greek deficits in the 1980s are small relative to those of the mid-2000s, they are still very far from anything you could reasonably describe as "the country more or less paid its way." They are, for instance, significantly larger than the contemporaneous US current account deficits that were a central political concern in the 1980s here. That's the small problem; there's a bigger one. Because, what are we looking at? The current account balance. Krugman glosses this as "the broadest measure of the trade balance," but that's not correct. (If he taught undergraduate macro, I'm sure he'd mark someone writing that wrong.) It's broad, yes, but it's a different concept, covering all international payments other than asset purchases, including some (transfers and income flows) that are not trade by any possible definition. The current account includes, for example, remittances by foreign workers to their home countries. So by Krugman's logic here, the fact that there are lots of Mexican migrant workers in the US sending money home is a sign that Mexico is able to export successfully to the US, when in the real world it's precisely a sign that it isn't. Most seriously, the current account includes transfer between governments. In the European context these are quite large. To call the subsidies that Greece received under the European Common Agricultural Policy export earnings is obviously absurd. Yet that's what Krugman is doing. The following graph shows how big a difference it makes when you call development assistance exports. 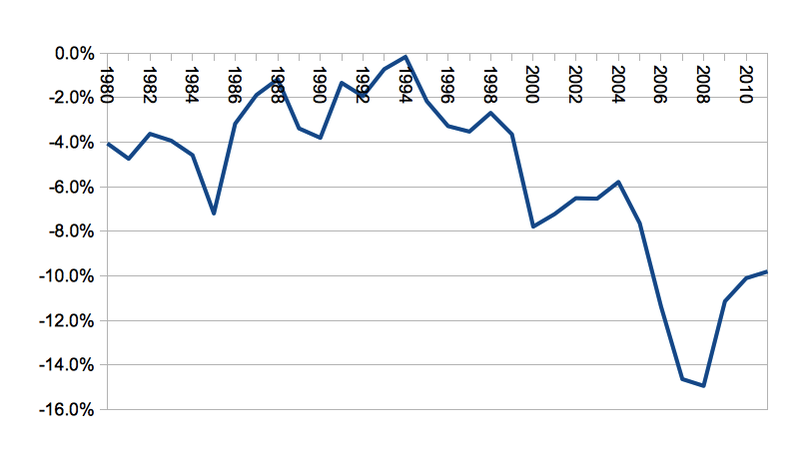 The blue line is the current account balance, same as in Krugman's graph, again extended back to 1980. The red line is the current account balance not counting intergovernmental transfers. And the green line is the current account not counting any transfers. 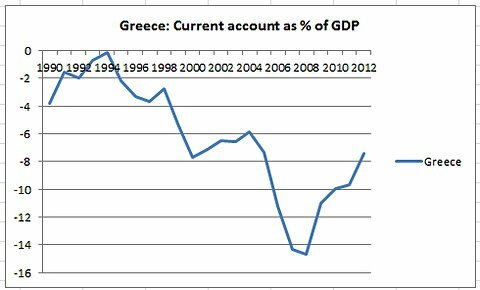 [*] It's clear from this picture that, contra Krugman, Greece was not earning enough money to pay for its imports before the creation of the euro, or at any time in the past 30 years. If the problem Greece has to solve is getting its foreign exchange payments in line with with its foreign exchange earnings, then the bulk of the problem existed long before Greece joined the euro. The central claim of the column is simply false. Again, it is true that Greece's deficits got much bigger in the mid-2000s. I agree with Krugman that this must have ben connected with the large capital flows from northern to peripheral Europe that followed the creation of the euro. It remains an open question, though, how much this was due to an increase in relative costs, and how much due to more rapid income growth. By assuming it was entirely the former, Krugman is implicitly, but characteristically, assuming that except in special circumstances economies can be assumed to be operating at full capacity. famous lack of competitiveness is a recent development, caused by massive post-euro inflows of capital that raised costs and prices. And that’s the kind of thing that currency devaluations can cure. The historical evidence is not consistent with this claim. Or if it is, it's only after you go well beyond normal massaging of the data, to something you'd see on The Client List. So why does it matter? What's at stake? I can't very well go praising Krugman for writing not only what's true but what is useful, and then justify a post criticizing him on the grounds of Someone Is Wrong On the Internet. No; but there's something real at stake here. The basic issue is, does price adjustment solve everything? Krugman won't quite come out and say Yes, but clearly it's what he believes. Is he being deliberately dishonest? No, I'm sure he's not. But this is how ideology works. He's committed to the idea that relative costs are the fundamental story when it comes to trade, so when he finds a bit of data that seems to conform to that, he repeats it, without giving five minutes of critical reflection to what it actually means. The basic issue, again, is the need for structural as opposed to price adjustment. Now if "structural adjustment" means lower wages, then of course Godspeed to Krugman here. I'm against structural whatever in that sense too. But I can't help feeling that he's pulling in the wrong direction. Because if external devaluation cures the problem then internal devaluation does too, at least in principle. The fundamental question remains how important are relative costs. The way I see it, look at what Greece imports, most of it Greece doesn't produce at all. The textbook expenditure-switching vision implicitly endorsed by Krugman ignores that there are different kinds of goods, or accepts what Paul Davidson calls the axiom of gross substitution, that every good is basically (convexly) interchangeable with every other. Hey Greeks will have fewer computers and no oil, but they'll spend more time at the beach, and in terms of utility it's all the same. Except, you know, it's not. From where I'm sitting, the only way for Greece to achieve current account balance with income growth comparable to Germany is for Greece to develop new industries. This, not low wages, is the structural problem. This is the same problem faced by any developing country. And it raises the same problem that Krugman, I'm afraid, has never dealt with: how to you convince or compel the stratum that controls the social surplus to commit to the development of new industries? In the textbook world -- which Krugman I'm afraid still occupies -- a generic financial system channels savings to the highest-return available investment projects. In the real world, not so much. Figuring out how to get savings to investment is, on the contrary, an immensely challenging institutional problem. So, first step dealing with it, you should read Gerschenkron. We know, anyway that probably the rich prefer to hold their wealth in liquid form, or overseas, or both. And we know that even if -- unlikely -- they want to invest in domestic industries, they'll choose those that are already cost-competitive, when, we know, the whole point of development is to do stuff where you don't, right now, have comparative advantage. So, again, it's a problem. There are solutions to this problem. Banks, the developmental state, even industrial dynasties. But it is a problem, and it needs to be solved. Relative prices are second order. Or so it seems to me. 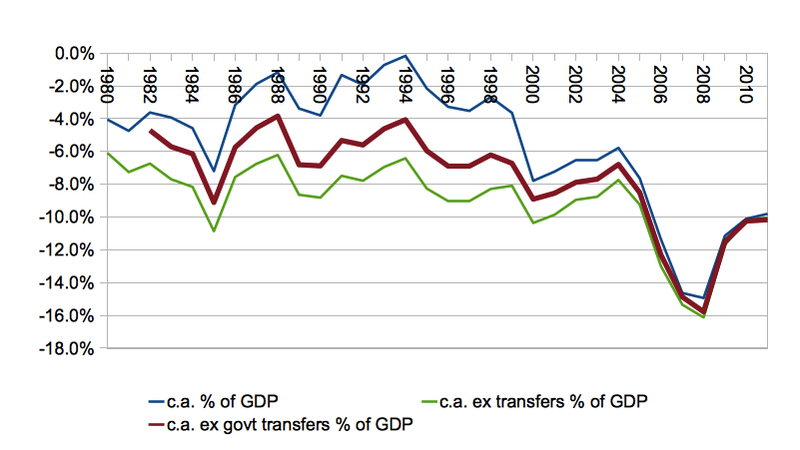 [*] Unfortunately Eurostat doesn't seem to have data breaking down nongovernmental transfer payments to Greece. I suspect that the main form of private transfers is remittances from Greek workers elsewhere in Europe, but perhaps not. Why are you watching The Client List? My excuse would be that Mad Men is done. But in fact I'm not watching it, just read about it on Gawker. "In the textbook world -- which Krugman I'm afraid still occupies -- a generic financial system channels savings to the highest-return available investment projects." But in fact the generical financial system did channel savings into Greece, the question is why didn't this create the "industrial base"? You're assuming that the pre-Euro current account (ex-transfers) is a problem that needs solving, by price adjustment or otherwise. Australia has been running a current account deficit for almost 50 years consecutively, and is not exactly a poster-child for suffering. Not assuming it, just conceding it for the sake of the argument. In fact I have brought up Australia's permanent deficit on the blog before. It's evidence both that floating exchange rates are not a guarantee of current account balance, and that persistent current account imbalances do not necessarily lead to crises. I don't know much about the specifics of the Australian case, though. in fact the generical financial system did channel savings into Greece, the question is why didn't this create the "industrial base"? OK, but Krugman might whip out some more graphs of his own, saying that basically Greece did not have faster income growth than the rest of the EU. In some periods it did, but those were basically offset by periods of below average income growth. Yet, according to your evidence the trade deficit was persistently negative. Here, I am looking at the period 1980-present. This is consistent with the story that capital inflows into Greece prevented the forex rates from adjusting sufficiently to balance the trade deficit, which is basically Krugman's story. I.e. capital inflows --> current account deficit, just as elsewhere he argues that Chinese purchases of U.S. treasuries are the main driver for the U.S. current account deficit, even though China's income growth rate is much higher than that of the U.S. It doesn't matter whether those capital inflows are due to EU agricultural subsidies, remittances, or foreign purchases of Greek debt; the capital inflows allow the currency to not depreciate as those who sell products to Greece must either re-patriate their revenue or re-invest locally in Greece. Without capital inflows, Greece could not have run persistent deficits, as the current account + capital account sums to zero. OK, so this is an equilibrium condition, but I think Krugman's point is that the capital flows tend to be the actor, and the deficit tends to be the re-actor. I think the reasoning is pretty good, and comes from observing the asian crises. That is what he means when he says that Greece needs to devalue. It is an equivalent statement to saying that there needs to be no more capital inflows that prevent the Greek currency from de-valuing. With a single currency, devaluation is impossible, but equally important, capital inflows must fully finance the trade deficit. If Greece had its own currency, and its own central bank that would set interest rates at a level that discourages foreign capital inflows and encourages domestic investment, then the trade deficit would narrow or swing to a surplus, and this would be the case regardless of whether incomes in Greece were high or low. Such an adjustment need not be accompanied by a decrease in Greek incomes, but it does need to be accompanied by a reduction in Greek consumption. This is again the China story. Which is not to say that income differentials play no role in the export story, but I don't think you are making the case for that here. I was actually thinking of writing something very much like this myself, as Krugman's hypothetical response. My first response is that while this may be true, it's basically a theoretical claim -- the "evidence" he presents does nothing to support it. 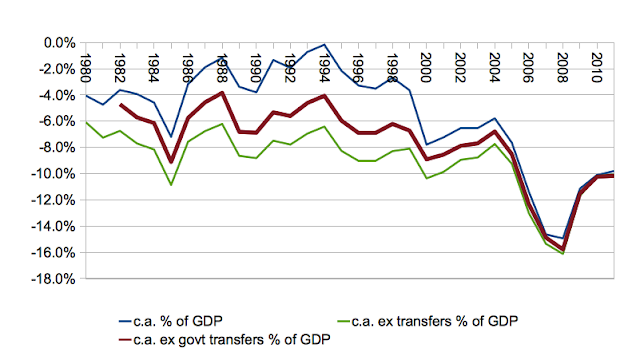 Greece had a trade deficit of 5% of GDP in 1994, roughly balanced by inward income and transfers (mostly EU assistance). You can argue if you want that the trade balance is strictly endogenous, it accommodates to the difference between the exogenous income and capital flows by way of exchange rate adjustments. But the fact that net capital flows happened to be zero in a particular year is not in any way evidence for that story. It's just being assumed a priori. On the larger point, these are tricky issues that I am still trying to think through. But I do have a question for you (or for your Krugman persona): why didn't capital flows into Greece produce lower interest rates, rather than higher prices? Or conversely, why wouldn't a low-interest rate policy followed by an independent central bank also produce inflation? At some level of abstraction, aren't increased liquidity due to expansionary monetary policy, and increased liquidity due to foreign demand for your assets, macroeconomically equivalent? Krugman's implicit model may be consistent and clear to him, but it is not clear to me. What e.g. is he assuming about capital mobility? You are right that in this post I am not making a case for income vs prices as the main driver of trade balances. I will come back to that, hopefully. why didn't capital flows into Greece produce lower interest rates, rather than higher prices? The ECB sets the euro-wide nominal rate, and then local real rates are whatever they are after subtracting out inflation in each area. But we do not need to look at inflation as causing anything, rather policies such as wage repression cause the capital flows and inflation differences are a by-product. That is my interpretation of the adjustment process leading to the new equilibrium in which Germany is a net exporter and Greece has the deficit. I am not going to speak for Krugman about capital mobility, but in my estimation, (financial) capital flows have their real correspondent as consumption flows as measured in the current account. Factories don't get up and move. There is some foreign direct investment, but it is small. Mostly capital flows consist of purchases of financial assets, primarily government and mortgage bonds. To argue that these foreign purchases directly cause rates to fall is difficult, as these are very liquid markets already. The rates will primarily be set by arbitrage with the short rate. For non liquid assets, I am always skeptical of "foreign buyers" driving up land prices. It is mostly the domestic population responsible for bubbles. IMO, the casual chain on the part of the importing nation is bubble --> increased demand for consumption vis a vis savings --> gap between savings and investment --> current account decrease. With prices not adjusting too much. Here, I am keeping government deficits fixed. It is only if you believe in RBC style models in which total income is fixed that you can argue a nation imports consumption in order to "free up" resources to create more capital and then pay back the foreign debt with a share of consumption later on. But we observe nations persistently exporting (financial) capital in order to promote domestic (real) capital formation, whereas nations that are importing (financial capital) do not increase their domestic investment, but rather decrease it. To me, wage repression in Germany, combined with rising wages in Greece are a sufficient reason to explain the shift in current account. Going back to your argument, it is not (necessarily) that income growth in Greece exceeded that of Germany, but it would have exceeded it had it not been for the current account. This is an argument that says the current account is one of the primary adjustment mechanisms (along with all the other income-based adjustments), when there is a gap between savings and investment demands. Also, the incomes model doesn't require Greece to have had faster growth than its trade partners. Rather, it requires that the ratio of Greek growth rates to the average of its trade partners, be greater than the ratio of the income elasticity of Greek import demand, to the income elasticity of Greek export demand. It's at least plausible that Greek imports are more income-elastic than its exports (admittedly tourism pushes against this a bit), in which case balanced trade would require it to grow slower than its trade partners. The key prediction is just that faster growth will be consistently associated with a worsening trade balance and conversely, which does seem to be true. Slightly OT, but I think that this is relevant with regards of the argument ot trade unbalances in the EU. According to this theory, Germany export success is not the result of an innate strength but a pathological phenomenon, as it reflects a persistent rise in the value-added of German exports accounted for by intermediate imports. As far as Sinn's bazaar economy theory goes, the authors note that since the mid-1990s, the share of imported inputs in the export sector increased from 28% to over 42% in 2005, while the share of domestic value-added inputs fell correspondingly. As Germany is geographically closer to the east European markets, it is possible – in the words of the authors – that “to the extent that Germany has taken advantage of this opportunity at a faster pace than other industrial countries, it could have improved productivity and increased its export market share. From my annedoctical point of view, many important italian manufacturers (for example Fiat) relocated their production facilityes in eastern europe (and more recently in Serbia) where wages are much lower than in Greece or Italy. This is interesting because it puts the story as a competition between Greece and Poland, not between Greece and Germany, and because it stresses the sheer "geographical location" factor. Also, it seems that Eastern European economies are highly leveraged (they bet heavily on growth), so they could be the next shoe to fall in the european crisis. This looks interesting. It does seem like essential next step is a more disaggregated look at European trade flows, in terms both of countries and of commodities. In the case of Greece, for example, it seems likely that the 2004 Olympics played an important role in the deeper goods deficits in the 2000s, something that might be visible in a more detailed breakdown of Greek trade. And more generally, intensified intra-Eropean specialization, and a concentration of manufacturing in Germany and its eastern satellites, may be -- as I guess Sinn suggests? -- an important part of the story. Unfortunately this is a bunch of powerpoints with few explanations, however there are many interestig factoids about EU economy before the crisis. Very interesting page 17, with a comparison of the cost of labor in Europe (note the ultra low costs of eastern european countries at the bottom). Unfortunately there isn't the Greek value, however even Portugal labor is twice as expensive as eastern european labor. Also this table shows that labour in Italy, Spain etc, was already much cheaper than in Germany, so the idea that those countries need internal devaluation looks even stupider. The best discussion of relative labor costs in Europe I've seen is here. One point they make is that the rise in unit labor costs in Southern Europe relative to Germany was starting from a position of substantially lower costs in the South, so it was a process of convergence rather than divergence. This does mean, tho, that "already" in your last sentence should be "still". I'm generally a bit skeptical about dichotomies: yin and yang, "there are two kinds of people, . . . ", and economics seems chock full of them already, what with supply and demand, not to mention the Manichean Capital v. Labor, etc. Still, I cannot help feeling that we would be better off, if we held to a very strong typing, which distinguished financial capital from factor (or "real") capital (apologies for the conventional use of "real"). There's a critically important tension between capital as a factor input to production, and financial or money capital, denominating contracts and deals and debts and generalized (aka marketable paper) claims on ownership or purchasing power. Capital as a factor of production -- part of the classical trium with Land and Labor -- is embodied, generally, in sunk-cost, generally somewhat dedicated, organization and equipment. Capital was said to earn Interest as its characteristic income, but that's not quite accurate. Factor, or real, capital, in production, earns a quasi-rent, reflecting its sunk-cost, dedicated nature. It is Financial Capital, which receives income as Interest. The contrast between Financial Capital and Factor Capital is instructive: the former is everything the latter tends not to be: fungible and liquid and supremely mobile, flowing like shiny mercury in contrast to Factor Capital's rusting solidity. The transformation of Financial Capital into Factor Capital requires some unidentified philosopher's stone of economic alchemy. I don't propose to identify it in a comment, but simply to point out that such transformation, such transmutation of Financial into Factor Capital (when we're feeling fanciful), is at the core of economic development and the industrial revolution, and distinguishing Financial from Factor Capital is a necessary distinction, even to recognize this core process as transformative. Circling back to Krugman's economics and/or economic ideology, I see two oddities at work. One is that Krugman's neoclassical economics does not want to accord Money, and therefore Financial Capital, an independent existence as cause; Money is maya, an illusion and fundamental analysis, strips away Money and Finance, to get at what is "real". I think Krugman's righteousness gains reinforcement in this case from this methodological confidence that Money (and by extension, Financial Capital) shouldn't matter, even when it clearly does matter. Blame the Euro is just an extension of the themes of Blame the Fed. I remember the exchange with Keen, in which Krugman wondered aloud why anyone would want to model Money (and Banking and Credit and Finance), when prices seemed sufficient. The alleged sufficiency of price adjustment is of a piece with a macroeconomics, where money is reduced to equilibrating prices, a thin coverlet over the fundamentals of the "real" economy where factor inputs are transformed in production into output of goods, and the full matrix of prices can be furthered reduced to a mere projection onto an macro-equilibrating price level. Yet, here we are, in a world, where the claims of Financial Capital are being pressed with a political fury and force, which threatens to sweep away democratic government. The other oddity at work in Krugman's economics / ideology -- which I may be projecting onto the case -- has to do with his own faux-Nobel-winning work on trade. Increasing returns to some investments in Factor Capital have an enormous influence on patterns of long-distance (aka international) trade, and the quasi-rent returns on these particular investments in Factor Capital determine the terms-of-trade and drive incomes -- labor income and unrelated factor capital incomes as well as the income due to the factor capital invested in particular industries demonstrating very large increasing returns, network economies, etc. Krugman didn't discover these effects. Others, both economists and practical men, had noticed generations earlier. Duh. Krugman's success in modeling these cases made them somewhat more acceptable to notice them, within the scope of mainstream 1st-best analytic economic reasoning. Yet, somehow, economics -- even Krugman's own analysis -- still seems determined to backslide from the implications of those insights to a vision of trade driven by "comparative advantage", which slights both the critical importance of increasing returns on some Factor Capital, as well as the implications of quasi-rents and the income distribution effects. In Ricardo's analysis of comparative advantage, poor and unproductive Portugal benefits from trade with rich and supremely capable Britain. It is all very idealistic in its promotion of a general interest. In real life, well over a million Irish peasants starved to death motivating repeal of the Corn Laws, while Britain's support of Free Trade lasted just about as long as its ability to earn rents from its lead in the Industrial Revolution. There's something strange about the inability to get economic analysis of trade to support a realistic narrative, and I see it repeated here by Krugman, whose work on trade would really seem to be a path away from comparative advantage as a framework. But, maybe, that's unfair.